In my collections of conus I have quite a few "freak" specimens. I consider freak specimens to be those with characteristics that are not comparable with typical specimens. This could be in the form of a strange new pattern or color, as well as obvious growth defects both natural and/or with man-made aspects ( like pollution ). In terms of pattern or color, I dont think a shell should be specifically labeled a freak, unless the pattern is due to a growth flaw or other defect. 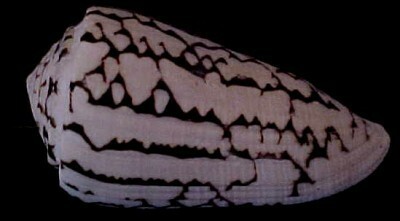 For example…… this picture of a beautiful large 115mm Conus marmoreus has a particularly beautiful and odd pattern, but I would not call it a freak! I think of this as more of a color/pattern variant rather than a freak pattern. Here is a lovely group of odd conus, all with a turreted or "stepped" spire…..a growth defect that is not terribly uncommon among different species. As pictured left to right, Conus bandanus 103mm, Conus imperialis 96mm, Conus miles 98mm, and Conus caracteristicus 52mm. Sometimes a growth defect is limited to an area…..for example in this pair of conus, a bite or other anomaly has caused a sharp keel in the shoulder , which resemble a hump or several humps. From left to right……Conus litteratus 105mm, and Conus flavidus 42mm. ( picture is labeled mvc017s.jpg). 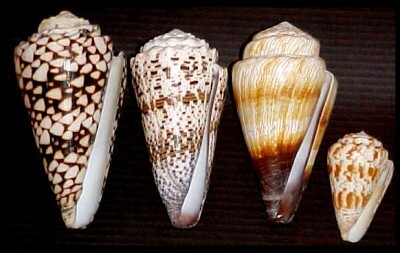 Here is a lovely grouping of freak Conus janus, in sizes ranging from 45mm to just over 65mm. The specimen on the top has a badly injured shoulder, giving it a tremendously large humpback. The specimen on the far left with the exquisite pattern has a very widely flaring lip. The next specimen over had a stepped body whorl and I placed the shell so it can be seen. The next specimen has a very large humpback, and the specimen on the far right has a very nicely shaped turreted spire. All of these shells are very beautiful to me. These were collected in Madagascar. Here is another wonderful trio of freak cones……a splendid Conus textile forma concatenatus, 64mm, collected in Madagascar. It has a flagrant bite or anomaly on the dorsum by the shoulder, which not only distorts the shell but created a very fine small wing like projection. A rather interesting piece. Below this to the left, is a spectacular shell within a shell, so to speak. A Conus inscriptus, 49mm, fished off of India. This piece is very heavily turreted, giving the appearance of another inscriptus growing inside the bigger inscriptus. A very handsome specimen!! To the far right, is a grossly turreted Conus ebraeus, with a superior thick turret spire growth. I was very pleasently surprised to see this specimen arrive to me, and it was collected in the Philippines…..it measures 28mm and also has the appearance of a shell growing out of another shell. Also from the Philippines, a lovely Conus virgo 107mm, with a bizarre "canal" running along the entire first whorl,,,,,forming a deep interior suture. This canal also has no color, while the rest of the shell is a deep yellow-pink. It gives the appearance of a mushroom type shoulder. This is also a very beautiful specimen. (unfortunately is light due to color of shell ). Here are some examples of extreme freaks…..this is a grouping of fantastic Conus betulinus I received from Madagascar last year. They range in size from 46mm to 60mm. The top specimen is very bulbous, and although you probably cannot see how so from the picture the bottom half of the whorl is quite slender while the top of the whorl by the shoulder is inflated. It looks like a small pear. The specimens below this are all extreme injury freaks, with the most bizarre one being the specimen on the far right, which not only is flattened, but also has two large "varices" formed from the whorl, which you can see has overlapped both the lip and the outer shoulder. If you look closely inside the aperature you can see the beginnings of a "second shell" growing from within. This extra area would be similiar to our own scars, where the area raises itself and produces extra material. They are all very fascinating!!! The next picture is of the same shells but a top view to show the extent of the damage to these Conus betulinus and how they have grown around the injuries. Fascinating! My last grouping of the day contain some rather mild freaks….specimens which are "tilted" or grow on a mild curve such the wonderful Conus terebra 49.8mm to the far left, beside that specimen is a Conus tribblei 52.5mm which also grew on a slight curve. On the far right is an extreme injury freak Conus tribblei 26.5mm, in which the injury has caused the siphonal canal area to completely grow around it's own self. I suspect the snail had no problem siphoning water though , as the opening is much bigger than it would have normally been ! At the top of the picture to the right is a wonderful Conus litteratus specimen which has been seemingly sliced in half!! This anomaly was most likely caused by something stuck in the mantle perhaps a grain of sand ( ? ), as the slit does not go completely around the body whorl. It is a rather unique specimen and it measures 61mm. It also has the nice yellow banding which! makes this specimen even more prettier. All of these specimens were collected in the Philippines.